With the recent news about the conflict in Iraq, you may have heard reporters [or even military personnel—see Conflict confusion from the June 2003 issue of Creation] mention some places and towns from the Bible. One reporter, reporting from a beautiful garden location in a small town, said that the local Iraqis believe it to be the location of the biblical ‘Garden of Eden.’ But was the Garden of Eden really in Iraq? 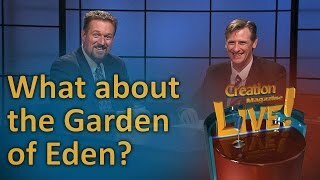 If we start our thinking with the Bible’s history, can we really know for sure where the Garden of Eden really was? The answer is a clear, ‘No.’ The Bible speaks of a worldwide Flood which covered ‘all the high mountains.’ This would have destroyed all vegetation and totally reshaped the surface of the earth. If Eden was in Iraq, it is now buried under massive thicknesses of Flood-deposited sedimentary layers. It is equally probable that the Garden of Eden is located directly under my house in rural Ontario (under less than 1 mile of sediment)! In Genesis 2:10, the Bible says that the Garden of Eden was where a river with one source was divided into four other rivers. That certainly doesn’t resemble what we see anywhere in Iraq. Unfortunately many Bibles include maps showing that Eden may have been in Iraq near the Tigris and Euphrates rivers. However, these rivers cannot be the original pre-Flood rivers, since they also would have been buried and destroyed by the Flood. So why do biblical names for those rivers exist today? After the Flood, when the descendants of Noah got off the Ark, they likely named the rivers in that area the Tigris and Euphrates because of memories of the pre-Flood rivers. A good example of this human tendency are the names of two rural towns near where I live in Ontario—Scotland and Paris. When immigrants came to Canada more than 100 years ago, they gave their new towns names that reflect ‘the old country.’ We see that everywhere in Canada. In addition, I heard another reporter mention the town of Ur, south of Baghdad, and he also mentioned that it was the birthplace of the ‘biblical’ Abraham. In this case, that really is the original site—because Ur was a post-Flood settlement. Several reporters talked about the looting of Baghdad’s museum as one of the most tragic consequences of the war because it contained artifacts that stem from the beginning of human civilization some 5,000 years ago. That time scale, by the way, approximates what the Bible says about the timing of the rise of post-Flood civilizations. All the reporters’ references to biblical locations signal something very important: Christianity is rooted in the real history of the real world. Christianity is unlike the many other religions that have a mystical origin and aren’t connected to real history. We can delight in the fact that, in a small way, the TV reporters in Iraq assume the reality of biblical history, even if they get it somewhat scrambled by their ignorance of the global nature of the Flood. It’s important for Christians to be able to show that the Bible is not just a collection of quasi-true stories but it is based in real historical events and places. For example, the real Garden of Eden contained the real man Adam (from whom we have all descended) who really disobeyed, requiring us to cry out to a real Saviour, who died on a real cross, forgiving the real sins of those who believe this real historical event and believe and trust in Him totally. Our magazines, website, and other materials—in fact our whole ministry, is geared to providing the information to uphold the real history in the Bible!